Pahnis Studios is located in the one of the most beautiful parts of Zante, just 300 m to the centre of Alykanas and 700 m from the beach. Providing an ideal base for couple or families looking for a relaxing holiday, this 2 Star hotel consists of 24 studios set in beautiful gardens. 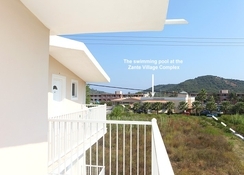 Guests can take advantage of the facilities at the Zante Village Hotel located 100 m next door. Getting to the Hotel: Zakynthos Airport is 17 km from the Pahnis Studios. Local Tips: Take a boat trip and visit the famous sites of the Blue Caves and the Shipwreck. 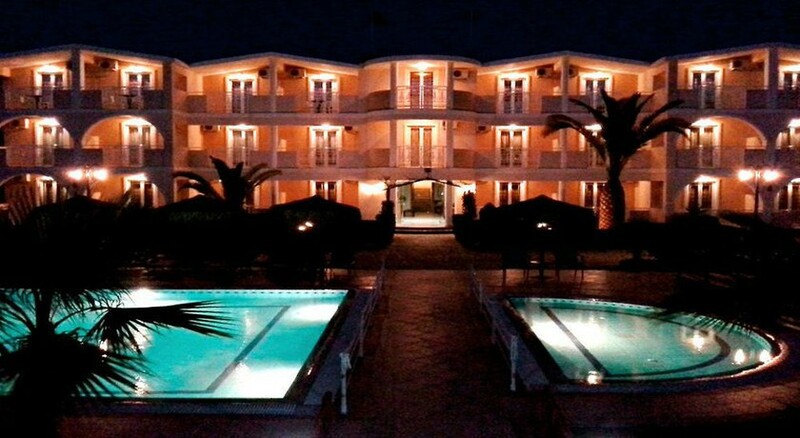 The hotel is 1.5 km from Alykes, 15 km from Zante Town and the main port, and 16 km from the Port to Kefalonia. Dining: The Hotel is booked as Self-Catering accommodation with an option for Bed and Breakfast. The next door Zante Village Hotel has a snack bar serving breakfast and food all day. Activities: Guests have access to the swimming pool with free sun loungers and umbrellas (100 m at the next door at Zante Village Hotel), beautiful gardens, TV lounge. Additional: Reception, advice on excursions and trips, Maid Service daily, linen is changed twice a week, mini market on site, car rental arrangements, safe deposit box (extra charge payable locally), Wi-Fi Internet access at the reception/lounge area and the balconies. Pahnis Studios features 24 studios for 4 guests set in beautiful gardens. 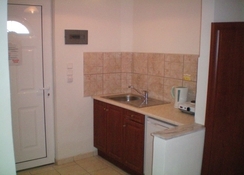 All studios have double or twin beds, and can easily accommodate an extra bed on request. A fully equipped kitchenette is available for making light snacks and includes all utensils, electric rings, kettle and fridge. 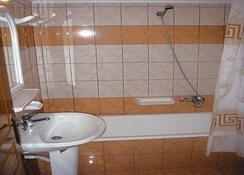 The separate bathroom has shower and WC as well as 24 hour hot water. Other amenities include Satellite TV and air conditioning (extra charge, payable locally). 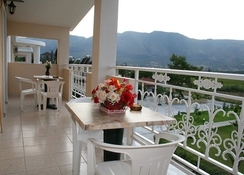 All verandas are fully furnished with mountain views. Free baby cot is available on request.